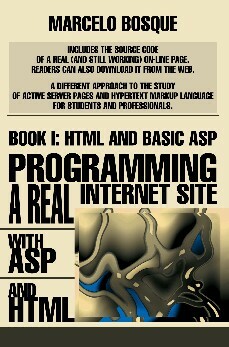 Most of the guides about HTML and ASP are “bricks”. A “brick” is a book that is so tedious to learn that people buy it, read the first chapters, and then place it in the bookshelf. *To be based in a real case. I’ve seen many programming books in my life. All of them have something in common: They just explain theory and show examples made up by the author. Some of them are inspired and their examples are smart. Some others look completely beyond reality. I wanted to make a different book, so I started to think in alternative ways to explain the subject. -Imagine a cool programming book. What are you expecting to learn in an utopist work like that?. Most of them wanted to read something Understandable. The second point they marked is that they wanted to learn things based on real facts. TO MAKE SOMETHING BASED ON A REAL CASE.